It was fun finding new homes for these models, and both the new owners and the original owners were delighted with the results. I can take on some commission sales, but with the economy in a slump, it may be best to hold onto your models for a while. With prices down, it's a good time for new Hartland enthusiasts to begin their collections, and long-time admirers to fill in some gaps. 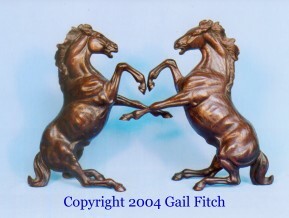 Check the current listings of Hartland western and horse models wanted and for sale by numerous individuals. Several people who repair or customize Hartland models are listed, too. Dark chestnut --cherry woodcut -- Mustangs, 9" series, 1960s. 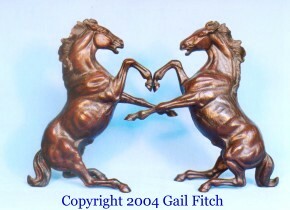 I don't want to split up this mint pair of Hartland Mustangs...They apparently spent the last 40 years together. Price: $85 postpaid by check or Paypal. Only $75 if you send a money order. They will decorate a corporate lobby!